The poor state of government hospitals drives patients towards private players and the high cost incurred there more often than not leads to abject poverty. Recently, social media played the Good Samaritan in securing Vimla Devi of Mathura a disability certificate for her husband. As 34-year-old Vimla did not have the money to hire an autorickshaw or a taxi, she carried her disabled husband Badan on her shoulders and ran from pillar to post to obtain the certificate that would entitle him to get a free wheelchair. The authorities woke up as the video clip of Vimla carrying Badan went viral and provided him a "70 per cent disability certificate" in no time. Badan, a truck driver, developed complications in one of his legs which had to be amputated. His medical treatment and the numerous visits to hospitals in Jaipur and Delhi cost the couple the little savings that they had. To run the household, Vimla started working as a cook and earns Rs 3,600 a month. Having faced the usual harassments in government corridors for not having the requisite photo on the papers, or that she had come on a wrong day as the certificate could not be issued on that day of the week, she found providence at last in the form of social media that put an end to her ordeal. This story with a somewhat happy ending is a rare one as there are many Vimlas and Badans out there who have no access to medical treatment - the primary reason being economic. The dismal state of government healthcare drives patients towards private players and the high cost incurred in the process more often than not lead to abject poverty. This situation is, however, not peculiar to India. In the US, the most common cause of bankruptcy in any household is due to expenditure associated with medical treatment.The situation gets worse with patients taking loans for treatment which they would never be able to pay back. To address this grave problem in a country with more than a billion population and around 200 million (according to World Bank Report Poverty and Shared Prosperity 2016) people below poverty line is not easy. 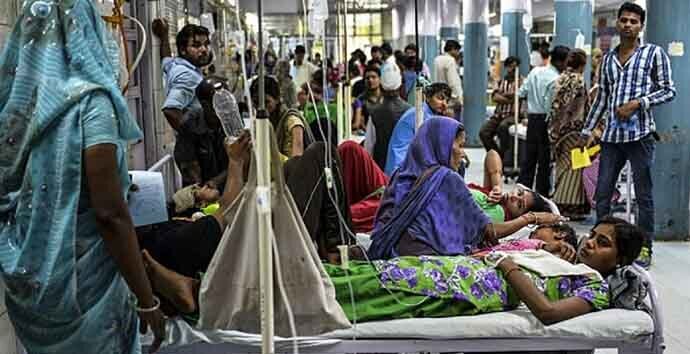 In February this year, finance minister Arun Jaitley revealed a healthcare plan in the Union Budget - labelled as Modicare, which is the world’s largest healthcare scheme. The National Health Protection Scheme (NHPS) would provide 100 million families with an insurance cover of Rs 5 lakh. There is an increase of 1,500 per cent from Rs 30,000 that falls under the Rashtriya Swasthya Bima Yojana (RSBY) and is implemented in 15 states. India’s ranking in healthcare is abysmally low - even behind some of the poorest countries, like Bangladesh, Nepal or Ghana. India’s government expenditure on healthcare is 1.15 pe rcent of the GDP - that is among the lowest in the world. According to a World Bank report, in 2014, China spent 3.1 of its GDP on healthcare, the United States spent 8.3 and India spent 1.4 of its GDP in the same year. If we were to draw a list of factors ailing the health sector, it would be a long one. To start with, there is an acute shortage of infrastructure and manpower - 0.7 beds per 1,000 persons and 0.6 doctors per 1,000 persons. There is a shortage of paramedics as well as teachers in medical colleges. India needs 65 million surgeries every year, but only 26 million can take place. According to WHO, India has the highest disease burden in the world, and it says India’s economic burden from non-communicable diseases will be $6.2 trillion between 2012 and 2030. Moreover, India not only tops in diabetes and heart diseases in the world, it also leads in HIV-AIDS and tuberculosis. Thus, the future cannot be more bleak given the fact that India has not been able to eradicate diseases like malaria which have been eliminated in the developed nations. Also tuberculosis, which has shown some resurgence in the US secondary to HIV infection, in a non-HIV infected individual is almost unknown. As far as the health workforce in India is concerned, according to a WHO report, there are 79.7 doctors per one lakh in the country with Chandigarh having the highest - 279.9 doctors per lakh - and Meghalaya 27.5 doctors per lakh population. In the rural sector, the scenario is further grim where 32 per cent patients have to travel more than five kilometres to access even primary health care. The government proposes to set up 1.5 lakh wellness centres under the Ayushman Bharat programme by December 2022. These centres will provide diagnosis and treatment for non-communicable diseases and common ailments such as hypertension, diabetes, chronic bronchitis; undertake screening for common cancer, apart from mental health and elder care. Setting up more government medical colleges and hospitals are also in the plan to combat the dismal health scenario. At present, there are 479 medical colleges affiliated to the Medical Council of India in 543 parliamentary constituencies with most of these located in urban areas. The new plan is to set up at least one medical college and hospital for every three parliamentary constituencies. The government’s plans are no doubt ambitious, but despite questions raised over the funding, many feel that this time the government means business. Unlike the earlier plan in 2016 of providing Rs 100,000 per family, that was not funded, this time funding is more likely to happen as the economy is better and, more importantly, the elections are near. Some medical experts believe that preventive and curative health must go together. With rampant pollution in air and water, the preventive health would take a backseat as it is also linked to the government’s pro-business policies. Apart from pollution, malnutrition, poor sanitation and lack of proper housing also contribute to ill-health. The new "Modicare" plan has been touted as the world’s largest health programme, and there is no doubt about it. But some medical lapses like the recent child deaths in Gorakhpur due to lack of oxygen supply or botched up sterilization cases of women in Chhattisgarh a few years ago are grim reminders to the state of the healthcare in our country, where quality does not count. Proper planning along with fund allocation can bear fruits only if corruption is rooted out without which quality healthcare will remain an elusive dream for Indians.